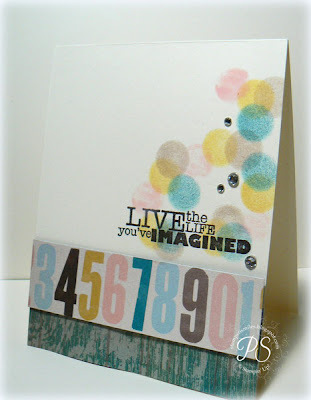 Stampsnsmiles: Ten Minute Tuesday.... barely! Whew! I made it just under the wire.... not just the ten minute part, but the Tuesday part also! The Soho Subway DSP is a brand new product from Stampin' Up! available for ordering on May 31st. The sentiment is also new and is from a fantastic set (which I can't show you yet) called Really Good Greetings. So today I decided to share with you my very first attempt at Bokeh. I've been wanting to try it. It's so fun and kind of a cool technique. "Bokeh is the photographing technique of aesthetically blurring the background; to exaggerate the effect of the lights shining in the background/foreground. The word bokeh comes from the Japanese word “boke” (pronounced bo-keh) which literally means fuzziness or dizziness. The bokeh effect transforms the overall look and feel of a fairly simple view to the one categorized as “awesome”. Click here for more details of this technique used in photography. 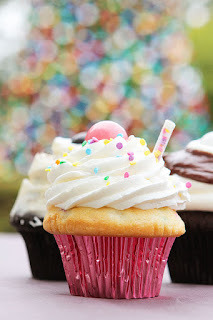 Here's a sweet example of it in photography - straight from Pinterest (are you following me yet? click here!) I've got a zillion ideas on my Pinterest boards.... some of which I've actually used! I created the "bokeh" using Sponge Daubers. They are a very cool little tool that come in quite handy and I'll have a few more quick and easy tutorials using them soon. Very Vanilla card stock, 4-1/4" x 11" - fold in half to create a 4-1/4" x 5-1/2" card. Adhere two strips of Soho Subway DSP, 1-1/4" x 4-1/4", to lower edge of card. The lower strip using Snail Adhesive, the top one using Stampin' Dimensionals. These overlap a little. 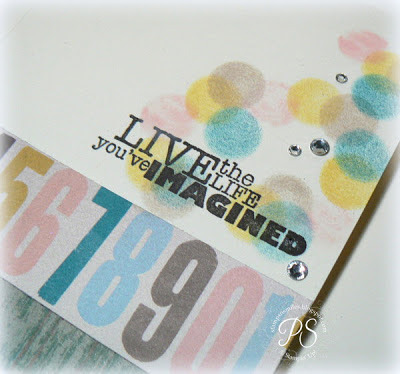 Create bokeh using Crisp Cantaloupe, Summer Starfruit, Crumb Cake and Island Indigo ink, using Sponge Daubers. I stamped off before stamping onto my card as you want rather light blurry dots. Using the Stamp-a-ma-jig to assist with placement, I stamped this wonderful saying in Early Espresso. I then decided I really needed the Crisp Cantaloupe in there also, so went back in and added them. A little bling and you're done! And, if you viewed this page on Tuesday, May 7th, bless your little heart for staying up so late..... now go to bed! That's where I'm headed. Saw this on the SU page...fabulous! Thanks for the heads up about that greeting set. It's pretty awesome. I absolutely love this card. I saw it at SCS. I'm not very active there, so I am so glad I popped over. You're a very talented stamper! I'm your newest follower! I'm going to have to try bokeh. Thanks for the inspiration! Ten Minute Tuesday ;;; or kind of! It's Fun to be part of a Team! A Teacher Thank You Purse!